The church of St Anthony-in-Meneage is open on Saturday, Sunday and bank holiday Monday, from 9am to 4.30pm. When not in the church, Ghost may be seen on the waters of the Helford River and Gillan Creek. Adam Chodzko’s iconic vessel Ghost will be taking passengers on voyages on Gillan Creek, near Manaccan on the Lizard peninsula, during Groundwork’s launch weekend. When not on the water during this period, Ghost can be seen in the beautiful small church of St Anthony-in-Meneage, near Manaccan. Footage recorded on recent voyages will also be on view. 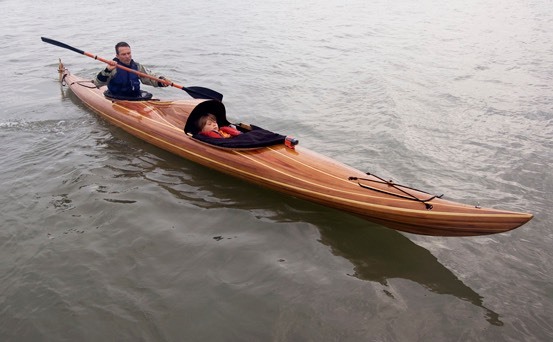 Ghost is a hand-made wooden kayak fabricated from hundreds of strips of different woods and is both a vessel and a sculptural object. First exhibited in the Whitstable Biennale in 2010, it has since travelled along the River Medway and the River Tamar, through The Olympic Park, London, along the Tyne and in creeks through Essex. In each location members of the public are carried in a reclining position, in a state between waking and sleeping, their passage recorded by a camera mounted on the boat’s prow. Selected footage from past Ghost voyages will also be presented at CAST in Helston, Tuesdays to Sundays, 10am to 5pm.